Feather fans are one of the most widely recognised features of burlesque. Typically a folding frame featuring huge ostrich plumes, these luscious props hide and reveal in a sensual tease. But where did these lavish feathered fans come from? Read on as we delve into the history of the iconic fan dance. Fans have a history stretching back over 3,000 years, with feathers being one of the oldest materials used in fan-making. Countries like China, India an Egypt produced fans made from feathers, with one of the oldest examples coming from the tomb of Tutankhamen, a gold fan mount with spaces for ostrich fans to be inserted. These fans were mostly large in size and required a slave to operate them. In India, small circular hand fans were created from peacock feathers and used for decoration and keeping cool. From the 15th century, feather fans were a fashion accessory for the European lady. Queen Elizabeth I of England had a particular liking for hand fans, and declared "the only gift worthy a queen is fans." Italy was also renowned for colouring ostrich feathers into all fashionable colours, and introduced the Italian fashions of fans to the French, who became predominant in fan production. The folding fan came about in the 16th century, and for the next 200 years feather fans fell out of fashion and were replaced by the paper or fabric fan. The feather fan made a comeback in the late 19th and early 20th century with hand-held fans echoing the costumes and props used in risque cabaret shows like the Ziegfield Follies and the Moulin Rouge. Ladies in the 1920s would carry a single, large ostrich folding-fan with extravagant plumage to accessorise their evening attire. In 1934, American actress and dancer Sally Rand took to the stage at the Chicago Worlds Fair, and performed her now-infamous "Fan Dance." 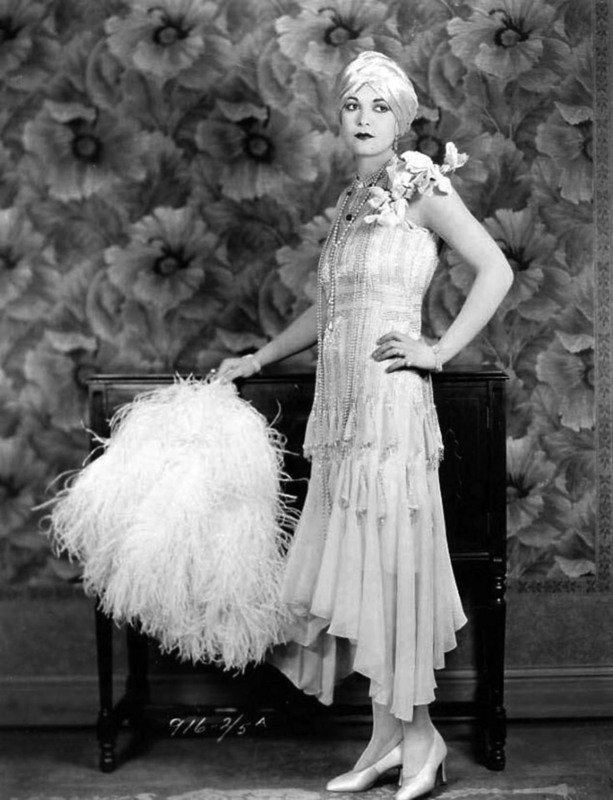 Rand, who resourcefully found a way to stay afloat in the Great Depression by combining her dance skills with a more risque performance, created a stir by appearing "naked" with only her feather fans, playing peekaboo with the audience with flourishes and twirls of her giant plumed fans to the tune of "Claire de Lune." Sally shot to stardom and continued to perform her famous fan dance well into her seventies. Many burlesque performers past and present have taken inspiration from Sally Rand's fan dancing, and feather fans arfe one of the most popular performance styles seen in burlesque today. Performers experiment with different types of feathers, shapes and even include light up LED features, or long lengths of boa to create stunning "waterfall fans." Famous burlesque performer and costumier Catherine D'Lish combines hundreds of feathers together to form the enormous plumed fans used by Dita von Teese. The one element that remains the same however, is the ability of the feather to create a luxurious and sensual feeling of glamour.